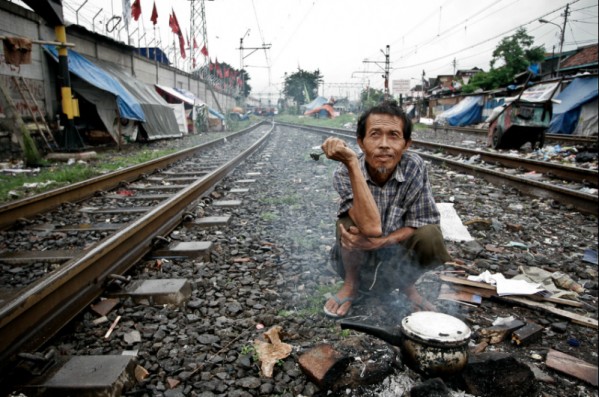 A man cooks his meal between the train tracks. The ground begins to rumble, and a deep and ominous sound steadily approaches, increasing in volume. Yet children play, their mothers cook, people shuffle off to work and back, neighbors chat, and elderly men sit in the afternoon sun playing a leisurely game of chess. Nobody even bothers to look up from what they are doing. A train passes only a few feet from a canvas shelter. The commotion is not the herald of some imminent disaster, but rather a train speeding down its tracks through the middle of the village. 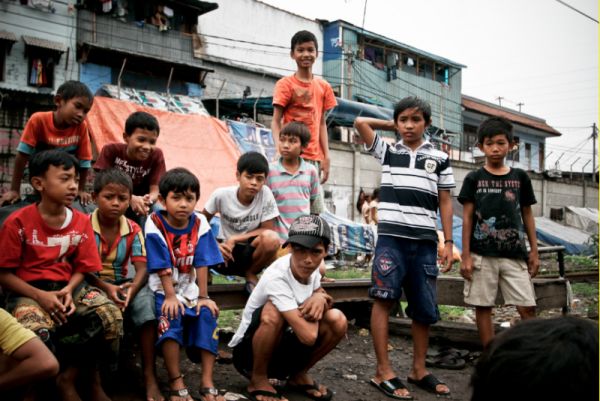 The noisy locomotive is both a potential danger and the lifeblood of this crowded shantytown in Indonesia. The air is thick with smells, some arising from the clogged Jakarta roads and their polluting traffic, others from the piles of rotting garbage and the overflowing gutters that wind through the area. 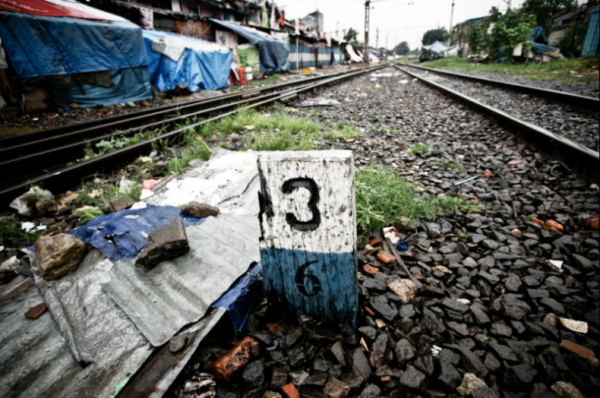 The trackside slum is a far cry from the air-conditioned high rises that dot Jakarta’s modern landscape. 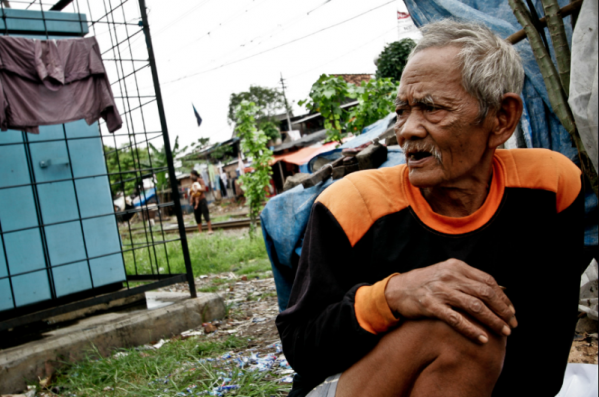 Residents young and old earn a living by collecting plastic waste to sell, or hawking small items from carts. 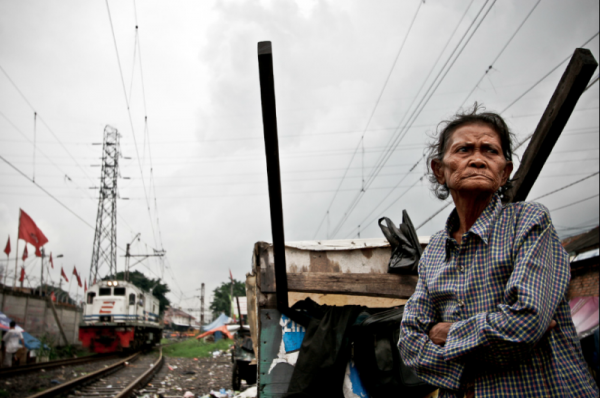 The people seen here, who live beside Jakarta’s Senen railway line, are expert recyclers. 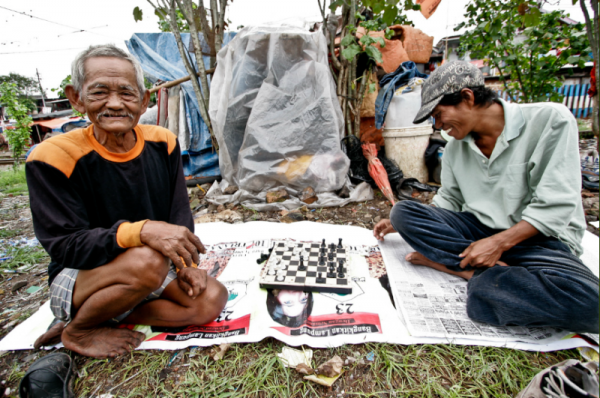 Many of them earn their incomes from collecting and selling the items that others throw away. Even their homes are put together from old canvas advertising banners, creating colorful if not completely sturdy shelters. Some luckier occupants can afford cardboard. This (obviously ineffective) sign warns that living on the tracks is illegal. Train tracks are not generally regarded as good playgrounds, but the kids who play along these tracks seem oblivious to the dangers. Perhaps they are simply used to the train times and know when to get out of the way? Still, there's no doubting that this is a precarious place in which to live and raise a family. Under these metal sheets rice is drying, to be sweetened and later sold as a snack. After gathering plastic all day, the collectors sell their yield before retiring to their shelters. 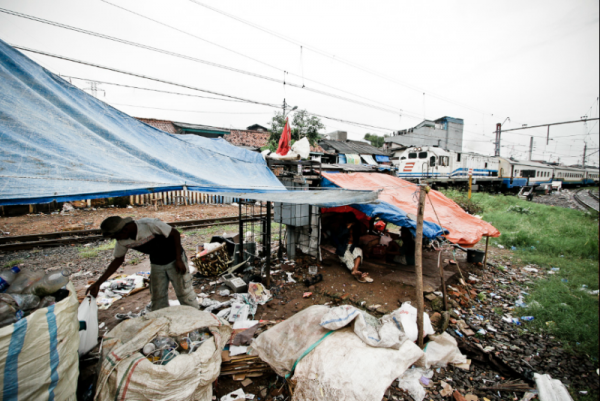 Despite their lack of amenities, these makeshift shelters on their tiny patches of land are surprisingly costly. Money has to be paid to local authorities for the right to a space beside the tracks. Yet for many low-income workers this is a desirable neighborhood, with empty spaces and access to the plastic debris that they collect and sell. Many would rather remain here, near a steady supply of work, than return and face financial uncertainty in their home villages. One of the most important vendors making their way around the slum is the water seller. Sloshed from one plastic container to another, this water is sold for up to the equivalent of 1 USD for a day’s worth of cooking and drinking needs. This might not seem like a lot until you realize that many residents earn less than $2 a day. Although this mother would like to return to the village where her older daughter lives, she needs the income she earns from working in the city. At that price (1 USD), water is too expensive to be used for bathing and laundry. The more fortunate slum dwellers have access to public bathroom facilities, with manual water pumps, provided mostly by the communities themselves and used by around 25 families each. No doubt you'd find yourself in a long queue waiting for a morning shower. 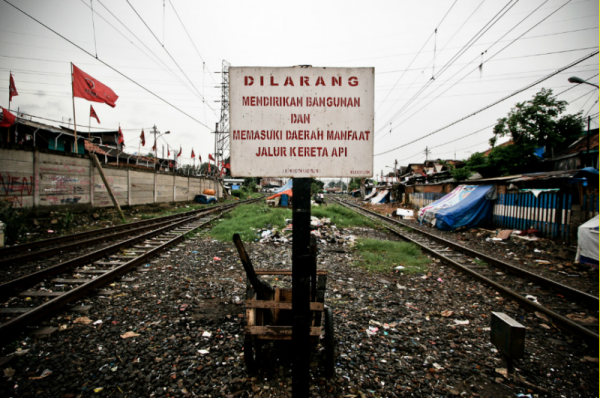 Lack of sanitation is one of the biggest problems for the dwellers around the Senen railroad, just as it is in other Jakarta slums. 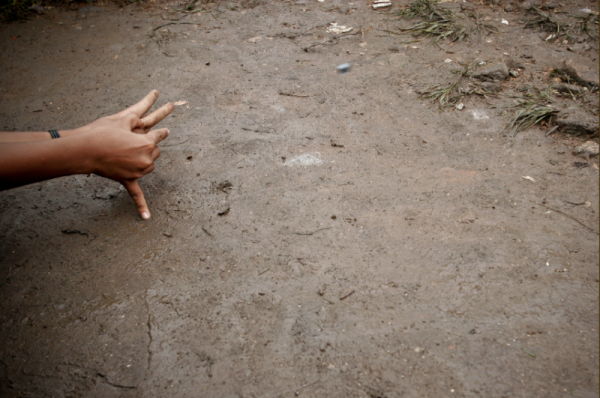 In 2008, a survey concluded that out of a city of 10 million people, just under half had access to sanitary water. In the absence of TV sets and video games, the children play with whatever they can find. 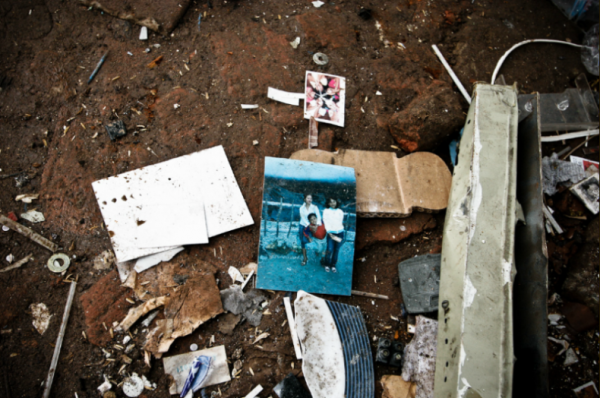 As you would expect, this lack of organized waste disposal and sufficient plumbing leads to a huge amount of disease – 120 million cases a year, with 50,000 of them fatal. The problem is made worse by the overcrowding of most slums, with residents generally squeezed together into small living areas. According to a survey, 70 percent of dwellings in Jakarta are self-built, and only half of these are fit for human habitation. The Central Statistics Agency records that, in 2009, 32 percent of homes in the city had a living space smaller than seven square meters (75 square feet) per capita. The tracks offer a relatively safe environment for children to play in – provided they know how to avoid the trains, that is. The assistant to the state minister has commented that the root problem is that most slum residents lack the funds, resources and know-how to make better homes. Also, since most are squatters prone to being evicted, it must seem pointless putting effort and money into the infrastructure (for example, plumbing) of their homes when they might be forced to leave them at any time. 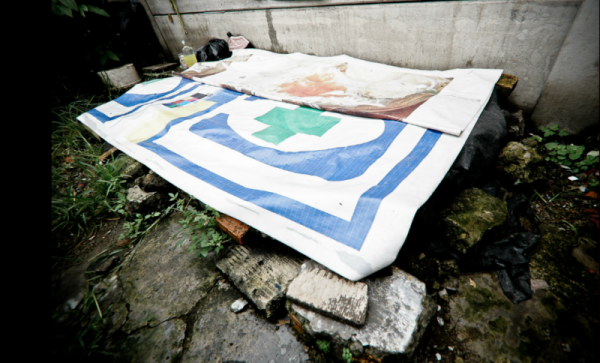 All that remains of this man's shelter is the canvas. Officials took away his poles and mattress, but like many others, he stays for the steady income. 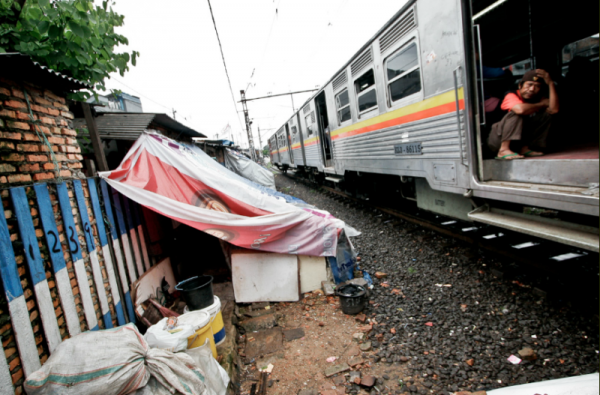 Various solutions have been put forward to tackle the problem of shantytowns, like this one by the tracks. The government and many NGOs are working in the slums to improve the lives of the residents through sanitation projects, education and improved nutrition. Yet of course, the sheer number of people living in these illegal settlements is a huge obstacle. Many generations live on the tracks, from the elderly to young families. 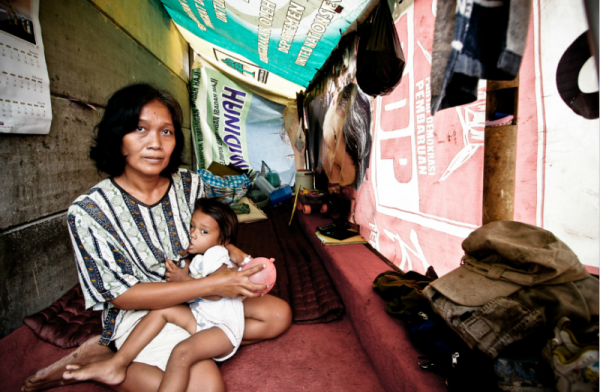 The government also has plans to build several housing projects, but skeptics are not sure how effective this will be: one reason people live in shantytowns in the first place is because of their proximity to the residents' workplaces. The children are not the only ones who come out to play here. Yet all is not so resolutely grim. 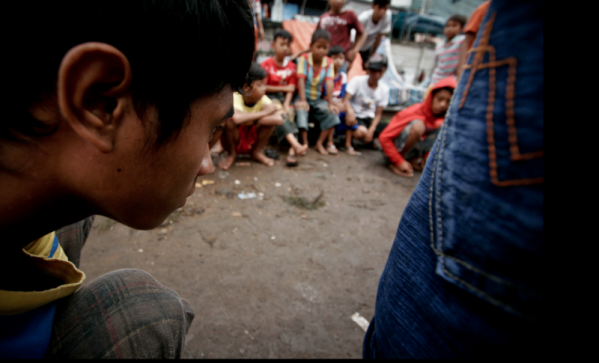 Despite its many problems, Jakarta's Senen slum is a community where people face their difficulties with stoicism and integrity. Despite their hardships, they know that they are creating better lives for their children by staying and working in the city.